What are two of the toughest elements to work with outside in the summer? Most of you will answer ‘the sun and rain’ and that would be about right. A harsh sun can exhaust anyone when it is beating down on you all day. And rain is going to, well, rain on your parade, to use a cliche! 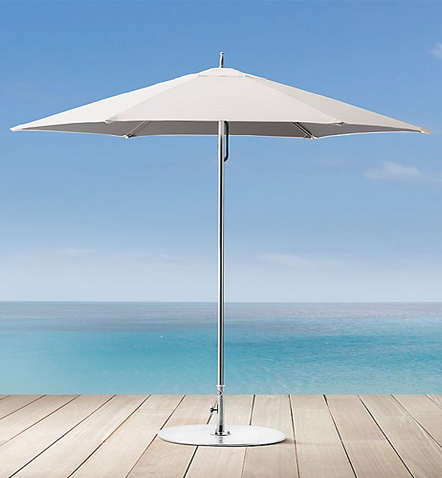 A patio umbrella can help you out tremendously with handling the sun. Set yours up correctly and rotate it with the sun and you can stay cooler all day. They also work great in a pinch when soft, unexpected, summer rains begin to fall. When a big thunderstorm comes rolling around though, it may be time to pack up and head inside. Three of the leading manufacturers in the industry are available for you to choose from. Each one produces excellent umbrellas with many features that will make your patio a more enjoyable place to be. Galtech has been dedicated to building high quality shades and umbrellas for 19 years. This has lead to them developing aluminum umbrellas that use stainless steel cables, wood umbrellas with 6 coats of marine grade varnish and their patented auto-tilt mechanism. They also have an incredible selection of Sunbrella fabric. The Cantilever models available from Treasure Garden are some of the most popular on the market due to their massive size and patented tilt and lock system. The easy to use foot pedal allows for quick rotation of the canopy through multiple settings. Tucci produces umbrellas with stainless steel components for added strength and durability in both harsh weather conditions and against regular usage. The reinforcements primarily happen at the strut joints. Their ballistic reinforced pocket construction also greatly prolongs the life of the canopy. If that isn’t enough, their saligna hardwood masts are marine quality laminated for greater life spans and stability. Browse the product descriptions above to find your ideal way to stay in the shade this summer, or contact us at Oakville Home Leisure to see how we can help keep you cool.